As they say in the sports world, it’s time for a homer alert. The unit from my home state — 1st Battalion, 25th Marines, out of Fort Devens, Mass. — has deployed to Afghanistan, taking over this week for 1st Battalion, 23rd Marines, out of Houston. The Massachusetts battalion is part of the Marine Corps Reserve, and includes Marines from across New England. It has companies based out of Topsham, Maine; Londonderry, N.H.; Plainville, Conn.; and Fort Devens. The unit will take over 1/23’s missions, which included providing security at a variety of forward operating bases, including Camp Leatherneck, the Corps’ main hub of operations in southern Afghanistan. That mission includes patrolling “Soak City,” a shantytown of squatters north of the base. Oh, my son in-law is at Leatherneck!!! Can anyone tell me what the tan thing is attached to the front of the rifle? 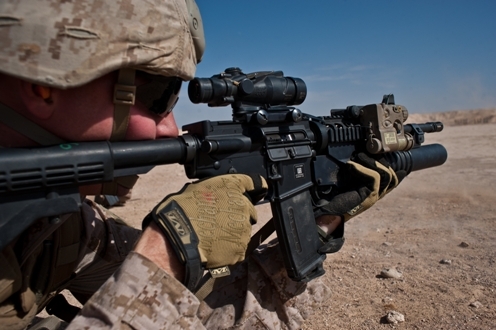 @ Bo, that would be a PEQ16, serves as a fantastic flashlight, along with a red dot laser that can be bore sighted to the acog which gives us more accurate fire at night, it is also armed with IR light, giving us the ability to see the flashlight/red laser dot via NVGs, keeping us more stealth at night. Its a great item to have on those long night patrols! Stay safe, come home ASAP and this country loves and respects all of you.